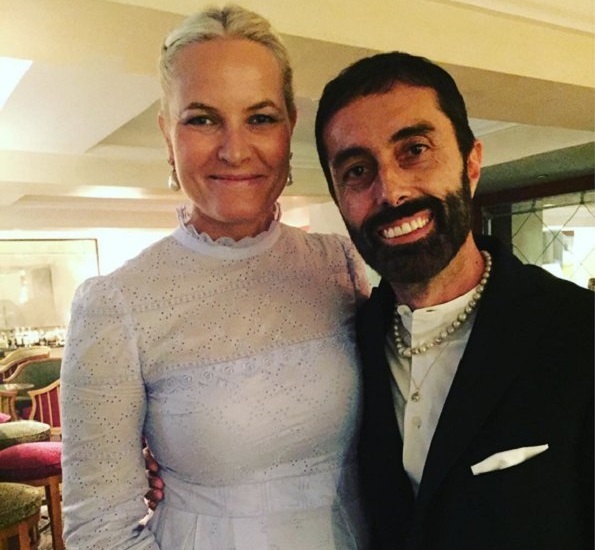 Crown Princess Mette-Marit of Norway and Crown Prince Haakon of Norway attended the 73rd Venice Film Festival on September 2, 2016 in Venice, Italy. At the Film Festival, Crown Princess Mette Marit wore Vilshenko Lavender Midi Dress. I do like this kind of braids. For girls up to 8 years old. 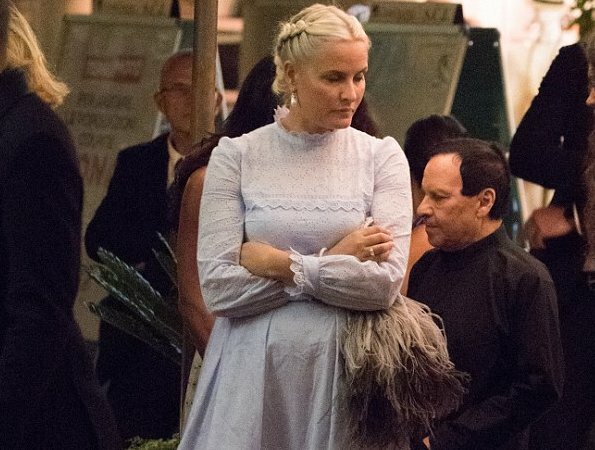 She is very beautiful, but that dress and the braids do nothing for her. Is't this festival a formal black tie occasion? Something serious must have happened to the Crown Princess. Is she healthy? Does she suffer from depression? But no one in her right mind will dress like this. This is no hate speech or a dislike for the Norwegian Royal House. She is not ambassador for her country and how can she become Queen? Is she a reincarnation from the Viking era? Each to their own. 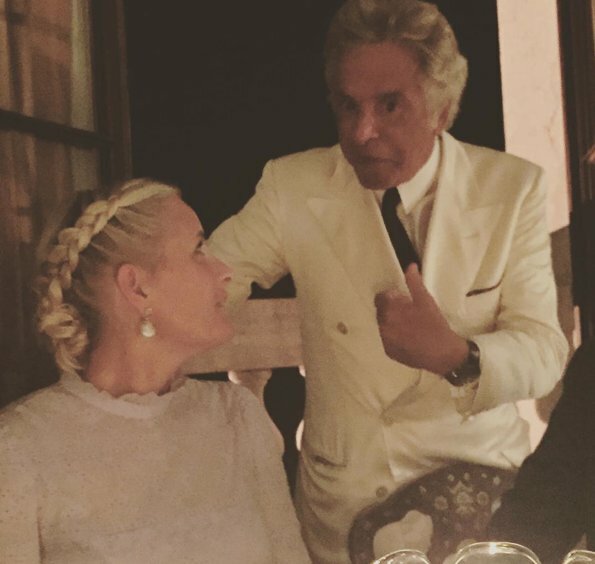 Mette Marit has her own style and dresses according to what she likes, as we also do. Several other Royal ladies have very distinctive styles and body shapes and they also dress accordingly to their personal preferences. I personally like women to look feminine. I do not like masculine arms, however I would never suggest that someone with masculine arms cannot possibly represent her country, or be a good ambassador for her country because she seems to have and penchant for body building, simply because I find female (well all body building distasteful). What on earth are you talking about? Bodybuilding? Masculine arms? No one has said anything about any of this? I have seen her in the dress before and I always feel the same. It is too tight across the chest and that style does nothing for her. She is not a skinny woman, not fat by any means, but built more like a mature woman. She needs plain simple styles. She is very beautiful and I have seen her looking lovely in formal wear. This was just a mistake all the way around. She looks out of place with her husband in his formal attire. 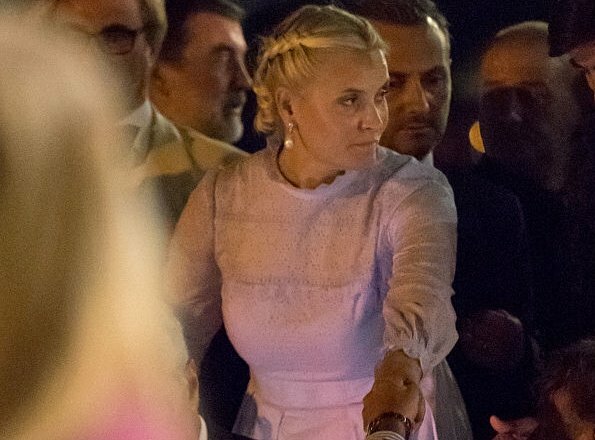 I am not a fan of this dress, and I also wonder if CP Mette-Marit may not have been feeling well (especially in those first two photos; she looks so unhappy); I hope that the photographers simply caught her in an off-moment, as I would hate to find out something is wrong. Those pearl drop earring, however, are a treat. They're absolutely stunning and perfect for her. Oh no....she looks like a big babygirl in that dress! Ooohhhh no.....I don't understang, why a future queen doesn't have fashion consultant? Or she has a fashion consultant but not qualified? Yes she looks like unhappy persin. Every time I see her with her husband, I feel their relationship doesnt work well. I realy hope, I am wrong because actualy I love them very much. Love the hair! It is very bridal. There are several a-listers pushing to bring things back to the "natural" 70s vibe. MM is with them and even CP Mary & our glam-gal Maxima have been moonlighting boho looks. It's hard to get behind MM when her husband looks so decidedly evening=/ on the fence here. 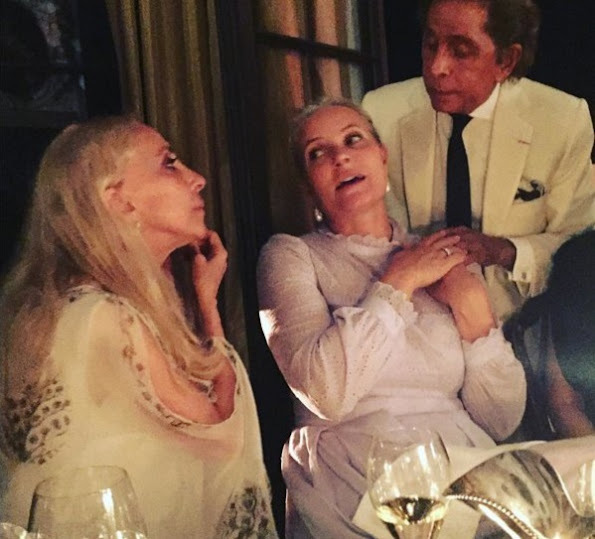 I hope Mr.Garavani gave her some suggestions like "burn that dress dear!" Day of granny´s nightie. Total miss. She's a handsome woman, but in these pictures she looks so much older than 43. Bad choice of dress among other things. No Louise not for me. It could be Mary Maxima Victoria Letizia Marie Kate Madeline Sophie Stepanie Charlene Mathidle... it could be ANYONE and i would say BLECH! It is not becoming on her at all! That is NOT BOHO in the manner of how the others are wearing Boho. This is a black tie event and she is dressed like she should be hitching a ride on a wagon. It has its place in perhaps another event? Say a country fair? But even then its too tight on her and looks bad. MM is a very pretty woman and this looks bad. I myself am talking only about fashion and nothing about the other points you raise. Totally agree with you Diane! It is not her hair Louise it is that God awful dress. PERIOD! 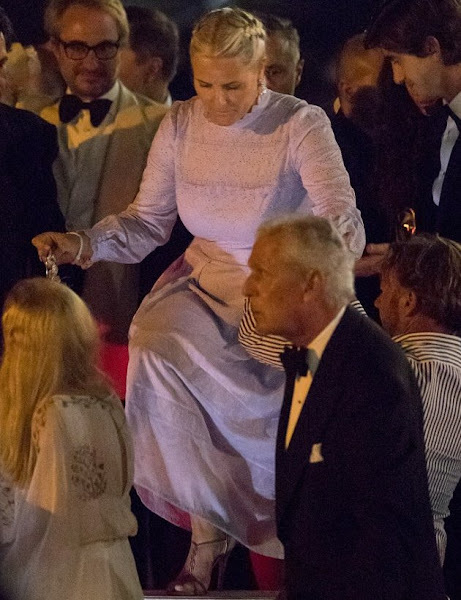 The Crown Princess is human and a women. Take away the Crown Princess title. She does not look healthy and happy in the first couple of photos. She is a woman in her forties - menopause? which is a normal stage in a woman's life. As a woman she might be suffering from something. Nothing wrong with it. But that dress is terrible it can cost a million I don't care. If she suffers from depression or health problem that's okay, but perhaps dressing up might just lift your spirit or don't attend such an event. Whether you the Crown Princess or ordinary woman on the street you have the right to feel "off". But then don't attend an occasion (also normal) where hubby is dress to kill and photographers are like hawks taking photos of celebs and royalty. I respect people's different personality, opinions and that we are not carbon copies, likes and dislikes. That makes the world interesting. Sometimes my comment on this blog is just to get reaction from people. Makes me giggles after a tiring day teaching children. Something is wrong with the crown princess and that is a pity. If (without any speculation) there is a situation or problem that she will get the support from the Norwegian Royal House. No criticism in my comment only concern. I love her to bits, but this dress looks frumpy on her and too tight across the chest. She seems to love these boho dresses - long, lots of fabric, flower prints, all sorts of trim and pleats and tucks...but in my experience the only sort of woman who can pull off such a dress is very young, very slim women.